Sorry for the lack of posts over the past week - real life has got in the way. Last week I managed to get a game in against Sean Sullivan which ended in a 10-6 win to him. I tried out a couple of changes to my list and this necessitated a couple of purchases. The Warp Talons I used have expanded to 8 and the extra three are now on the painting table. I also picked up a couple of metal Obliterators from Jordan Green and they have been undercoated ready for next spot on the painting table. The intervening real life was my mother died on Sunday morning. She got up out of bed, was having a cup of tea and had a massive heart attack, Apparently she was unconscious before she hit the floor. Mum had led a long life and she would have loved that she went out so quickly and without a protracted illness. Over the years she met a lot of my wargaming mates who came around for a game or a chat. Our family (including the cats) will all miss her but I'm glad she went out without any suffering. 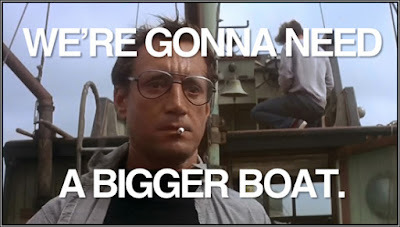 Next few weeks will see me prepping for the trip to Adepticon. Really looking forward to this. Keen to attend the various classes that Jack and I have signed up to but also to see some of the amazing armies that are always on show. There hasn't been a lot of creative hobby for me in the past week. A lot of my time has been spent on working on planning for the FOB NZ Grand Tournament and listening both to podcasts and battle reports. 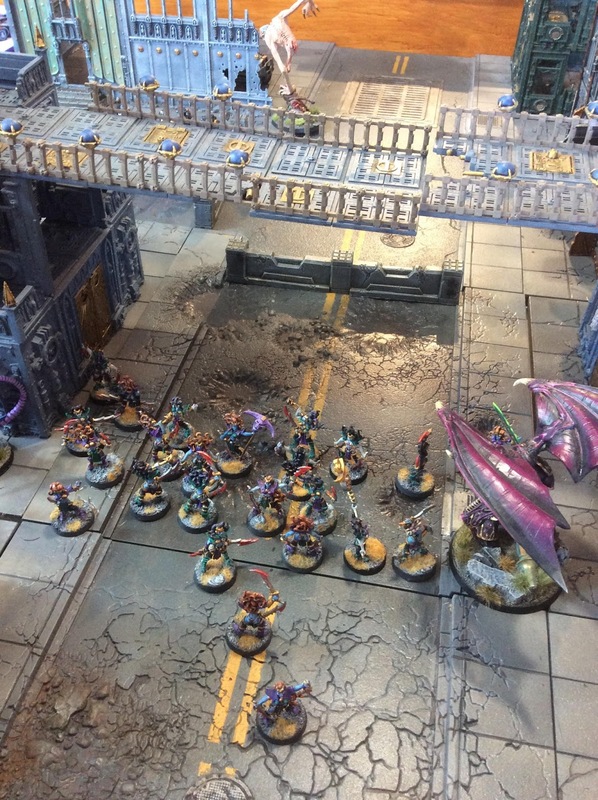 On Saturday was the first of the Warlords' Super Series for Kings of War. I had said that I would provide the terrain so got up nice and early so that I could be at the Club at 8.00am. By all account the event went well, being won by Hugh Dixon with Forces of the Abyss in a very tight finish - four players within a single point. The results have been uploaded and rankings updated to capture the event. I took the opportunity to have a couple of games of 40k. 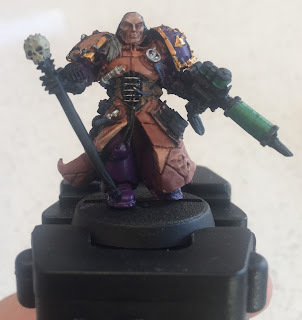 I've been working on my Emperor's Children 1750 point list and so took that. In the first game I played Alistair's Tau, deployed poorly and suffered an alpha strike which meant I was always behind. At the end of the game we shared the four objectives, both had Linebreaker but he had Slay the Warlord and First Blood. So a small loss but overall a very fun game against a great opponent. The second game was against Thomas' Wraith Eldar army. It was pretty much 3 big Wraith units, a Wraithseer, two Wraithlords plus Bonesinger and Spiritseer. Here I played much better both tactically and also mechanically. As it was a progressive mission, my greater mobility and number of units allowed me to always be ahead on the scoresheet. I worked at isolating one unit and dealing with it. There was one scary moment where Thomas got the Wraith blades into my Noise Marines and because I was Slaanesh he got 30 re-rolling attacks. 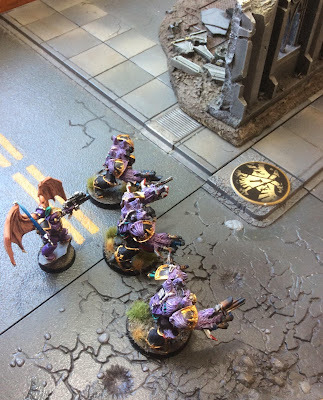 There was nothing left of the Noise Marines but they did inflict damage on the Wraithseer on the way out. In the end I had a very solid win due to points bicked up on objectives and kills plus Slay the Warlord, first Blood and Linebreaker. My EC start with 7 Command Points and in both games had used them all turn one. Unfortunately Chaos don't have a way to regain CPs so I suspect it is something I'll need to get used to. Twelve days after tickets went on sale and including the release of a further ten spots, the Fields of Blood NZ Grand Tournament has sold out. Really appreciate all the support. Sixty gamers have signed up and paid their registration securing their tickets. They now have 7+ months to plan and build their army and in some cases terrain. The hall has no further capacity to expand so no further places will be available. I am starting a wait-list in case there are any drops. Speaking of support, I'd like to welcome Mighty Ape onboard as a sponsor for the event. We are working with them now to provide participants with some discounts etc to help them in the lead-up to the event. They will also be providing some prize support. Appreciate the efforts of David Grieg and the team at Mighty Ape. 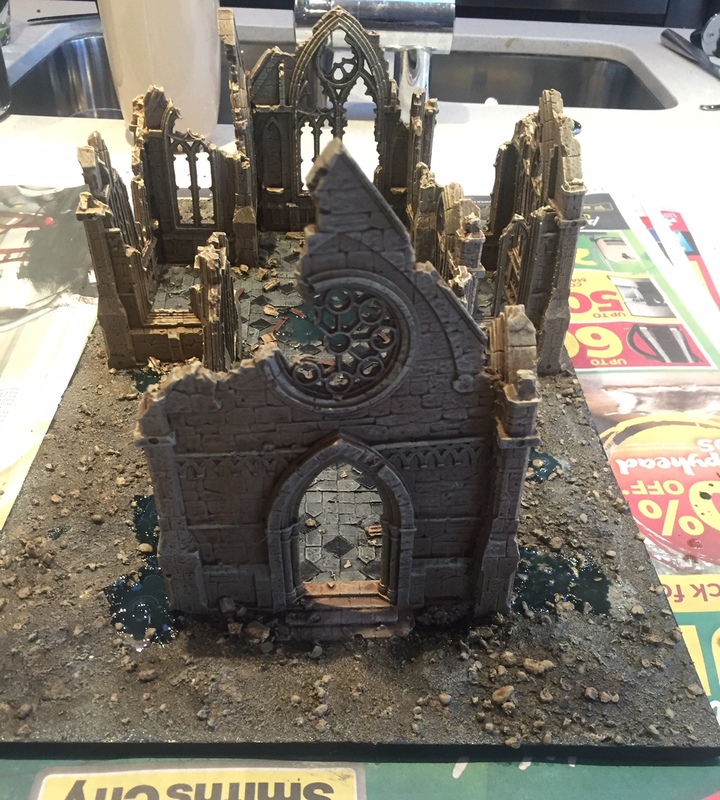 Finished up the Cathedral which I posted pictures of last week. 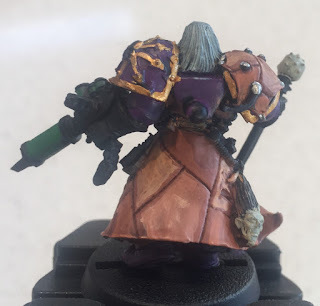 I ordered a Fabius Bile model from GW Direct which turned up last week and started painting that. It is quite interesting that in the game, while Heretic Astartes, Fabius may not belong to a Legion (even Emperor's Children). This will limit how much table time he sees - I'll use him in narrative games - as he needs a separate Detachment for you to maintain your Legion Traits. The base colours are laid down and I'm starting to tidy up all the errors. Once he's finished I need to do work on my WotR models and I have some existing terrain to tidy up. Fields of Blood NZ Grand Tournament hit its 50 participants on Saturday. I released the last 10 tickets yesterday and there are only two remaining. Once gone that is it. 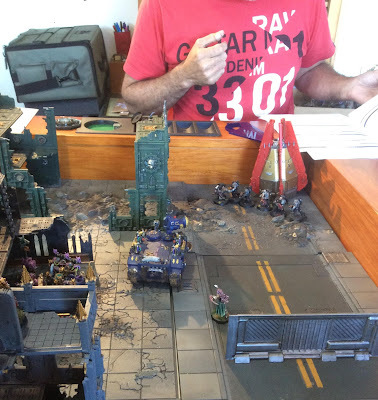 40k - NZ Grand Tournament Hits 50!!!! The fifty tickets for the FOB NZ Grand Tournament have been sold. A big thank you to all of you that have supported the event by buying a ticket. The capacity of the hall is limited and player comfort is paramount. That being said, I am going to check out the hall again today - armed with a tape measure and notebook. At the NZ Team Championships I have fitted in 33 gaming tables but that was very very tight. I am going to check dimensions with a view to adding 4-5 tables which would mean an additional 8-10 tickets (total 29-30 tables). Unfortunately that is the upper limit of the venue with no further opportunity to increase this year. Therefore these extra 8-10 tickets represent your last chance to participate in what will be NZ's premier 40k event. If you want in, now is your last chance. And aside of all this is that at capacity the event qualifies as an ITC "Major". 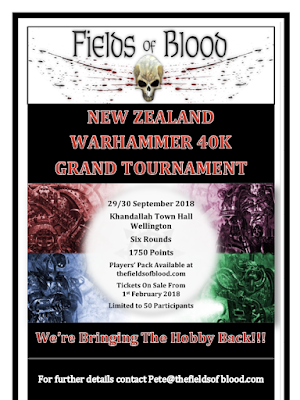 Down to ONE ticket left for FOB NZ Grand Tournament. Forty-nine have signed up and paid which just leaves the one. Who will be the Lucky Last? Last year I purchased the Ruined Cathedral from Puppet Wars. Over the past view days I constructed the building and painted it. The various parts are cast in resin and needed to have mold lines removed. They were also far from perfectly flat and trying to rectify this with hairdryer and hot water was only partially successful. I mounted the building on some 5mm MDF. 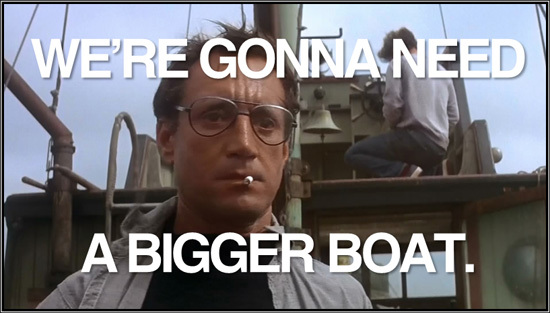 The base board is 20" long and 10" wide. I used Gorilla glue to stick it down - and together and then filled the gaps with Green Stuff. I then glued sand over the GS. Rather than go for a grey stone I decided that this would be a golden sandstone - think some of the British cathedrals e.g. York. I worked this up through 5-6 colours and washes. The internal floor is grey tiles with an inset black pattern. It has fallen masonry, wood etc scattered across the floor. Outside I built up the surrounds with filler then covered it with mix of river sand and stones. These were then washed and drybrushed. The final touch was to make yo some water effects to give some added colour. 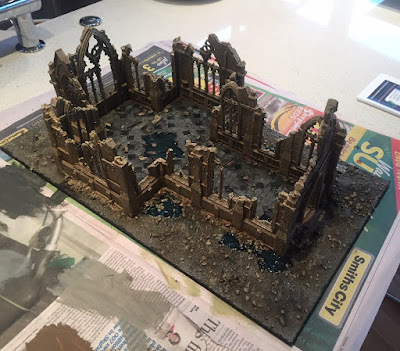 I mixed in some SWM Algae wash and then laid down a couple of coats. I'm happy with how it has come up. It fits a lot of game systems and should make a centre piece for my table. Yesterday Hagen and I had a game at 1750 points with him using his Deathwatch against my Emperor's Children. He used the list he had used in our last game which meant it was his usual soup of, in his words, "cool" units. From my viewpoint that just means every model is armed differently "just in case" - cue story of Skink Priest with Biting Blade/ Scout Champ with Power Fist etc back over 20 years. I used a newer version of my Emperor's Children incorporating those models I have recently painted. This included a single unit of Obliterators, the "Three Amigos" - Sparkle, Primrose & Moonbeam - and the Masque (which was found in Tom's wardrobe). We used my Chess Clock to time our moves. The game got through three turns in the 2.5 hours - but by that stage Hagen only had his Land Raider (on 10W), a Drop Pod and Inquisitor left. My turns took 30 minutes, 39 minutes and 18 minutes. Hagen's turns took 24 minutes, 29 minutes and probably 7 minutes - so he was far more on point. Ignore Hagen's questions such as "Are you sure your Rhino moves 12", can you show me"
Overall these were "Pete" problems and I'll address them from here on out. As for my play. I saw real benefit from the time I have spent watching battle reports, reading blogs and viewing games on Twitch. My placement was far stronger, my tactical acumen better and my application of rules nuances important. I was helped in that I got first turn in this game but I also felt that I made good choices. I've just got to make them faster. Tickets when on sale on Thursday. As of this morning there are 3 left!!!! Those that are coming can be seen in the "Event Registration" tab under the FOB banner. If you are wanting to attend the event you need to contact me and pay for your ticket. If you want to come to what is sure to be a premier event. Don't delay!